I can get inspired by all sorts of things, but the most common source of inspiration comes from a couple of genres in Jewelry. 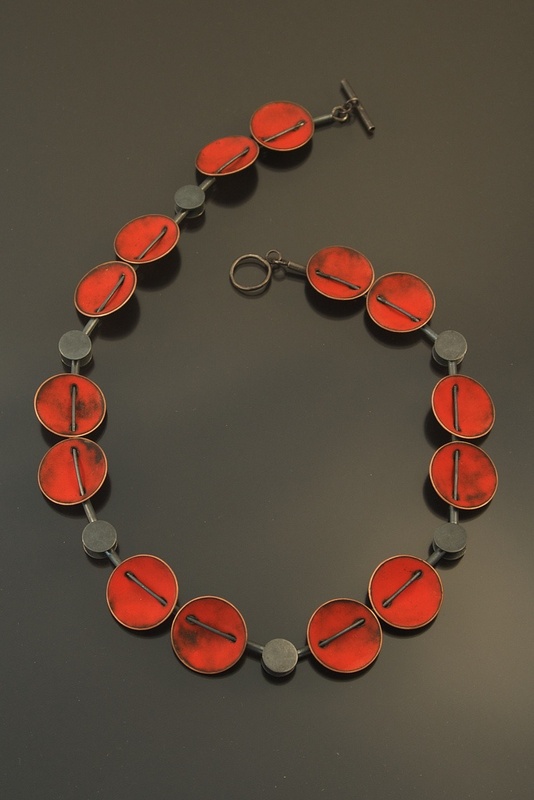 I took a spin around Pinterest yesterday morning and favorited quite a few pieces both in Contemporary Jewelry and Ethnic Jewelry. Inspiration for Asymmetrical design usually stems from Contemporary designs. 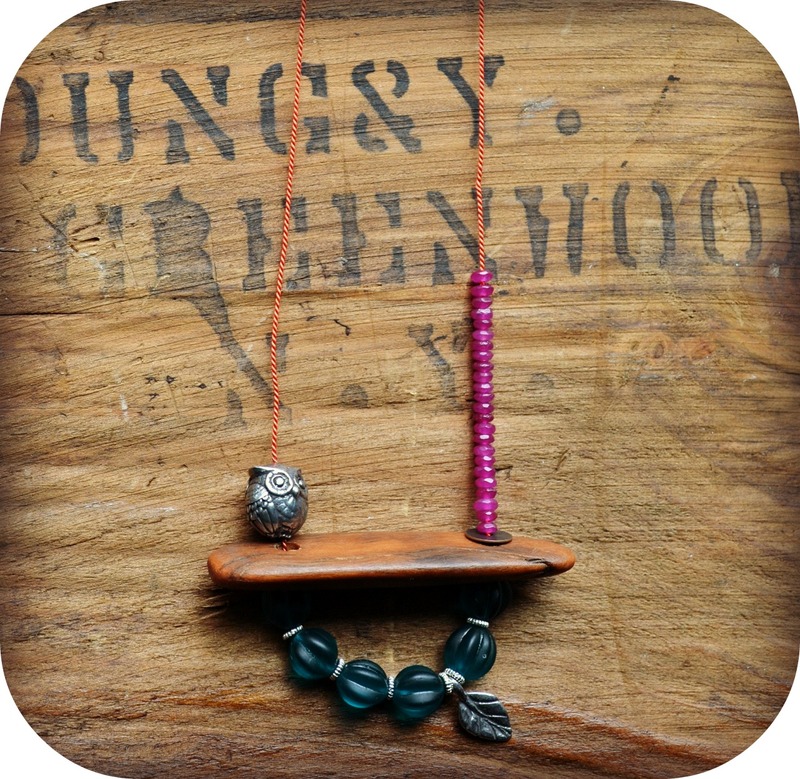 I found this simple necklace, on a cord, with a horizontal pendant and some beads. 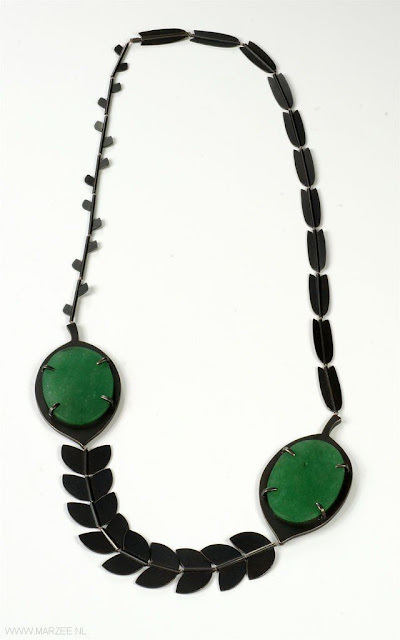 I love the simplistic nature of this piece, and the asymmetrical layout- but to me it looks completely balanced. This piece is from BHMakes on Etsy. Here is my take on this design. The general bead layout is similar but I used some art beads and a different type of wood bar focal. I brought in some faceted jade rondelles, some glass melons and a few pewter elements from Green Girl Studios. 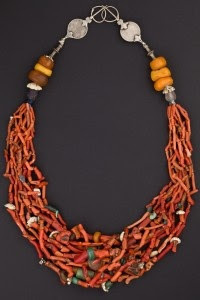 The necklace is strung on orange Silk griffin cording. 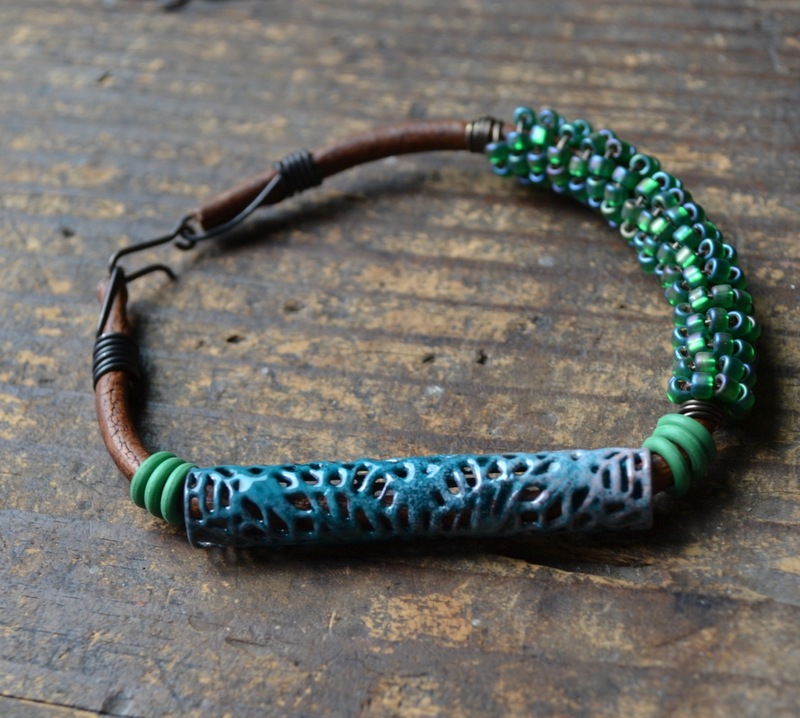 I searched Pinterest for some Ethnic bracelets and found this one. 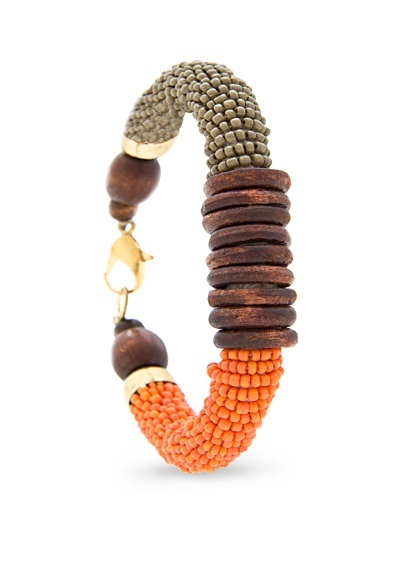 I love the texture of the wrapped seed beaded bangle and the two tone color palette, with the wood rings. I didn't have a leather or cord that was quite thick enough to achieve this look, but went with a smaller cord, one color palette, and asymmetrical design that turned out very asymmetrical and modern in nature. Here is my bracelet design. I used a long enameled tube from Gardanne beads, wrapped seed beaded wire, and just a few rubber o rings from My Elements. The bottom line is, you can be inspired by jewelry without completely copying the design bead for bead. Be inspired by colors, shapes, general layout of design, or materials and let your imagination run wild with your own design abilities and flair. Love the deep red color of this necklace, and how the discs are strung through holes towards the tops of each disc. This is an element that I could used in a piece of tin jewelry but maybe in smaller amounts, or in a bracelet design. Printed tin would give this piece a totally different look and add my own flair. piece using this same layout with different types of focals, and maybe some flat coins or different shaped Czech glass beads. has so much texture. I am inspired by the design and the beautifully finished areas like the clasp and where the multi-strands begin and end. 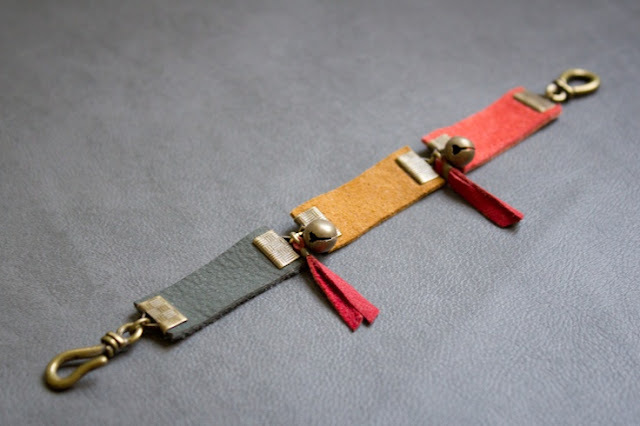 This flat leather bracelet shows that you could absolutely use some ribbon ends that aren't exactly the same width of your ribbon. It's still quite a successful piece, and I like the addition of fringe and bells in between the colors. The colors are great for fall and I like them mixed with the antiqued brass. Where do you get your inspiration from these days? And how do you decipher your own flair in designs that you see online? 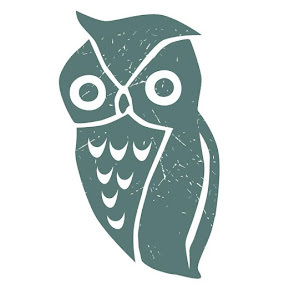 Nice to see your design process and the inspiration behind it. You've made the designs you were inspired by totally your own and that in and of itself is inspiring. 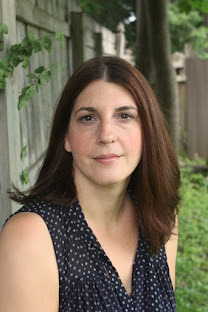 Great post Lorelei! It is very interesting to see and read about pieces that inspired you. I love that first necklace of yours, it is a lovely piece, and it was great to see where it kind of came from. That discs necklace is absolutely gorgeous! I look forward to see your take on it. Myself, well I guess that sometimes I am completely aware of what inspired me, but again sometimes I really can't decipher it. Even if I understand that I have probably seen something that inspired me at some point. A little thing here, another one there. A concept, a feeling, a touch, a combo of shapes or colors. Types of beads, or materials. Techniques. I love the seed bead bracelet! Bravo! I really like this post! Like I said on Facebook I really get inspired by my Pinterest board. There are quiet some pieces from you there, as from Songbeads, Something to do...etc. still have a lot to learn but I'm very thankful for the internet and all you posting your pieces on it, so I can climb the difficulty ladder one by one. Nice post - I agree completely about being inspired. Inspiration is a launching pad - one's own creative take is the leap OFF that launching pad to a new design (not a copy). 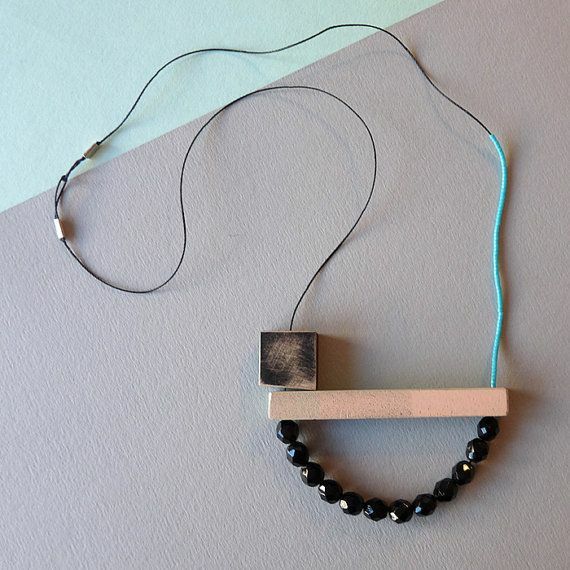 I really enjoyed this post and absolutely love your take on the first necklace! I too favor asymmetric designs and that one is very unique with a contemporary twist. Nice blog. I see colors blended in odd arrangement and take photo. I once combined a bright green of a glasses cleaning cloth, a purple Advair disc and an orange transpsrent pill bottle for a color combo. It was fun to show the close-up of just the colors to friends and let them guess what they were. Most only got the pill bottle. I see colors and textures everywhere as inspiration.